The mission of The Rendell Center is to promote civic education and engagement. To do this, The Rendell Center offers opportunities for educators, students, and the broader community to develop the knowledge, practices, and dispositions of engaged citizenship. For educators, The Rendell Center creates curriculum content, pedagogical tools, and professional development experiences. For students, The Rendell Center develops literacy based programs and experiential learning exercises. The Rendell Center for Civics and Civic Engagement is engaged in a bold experiment to create democracies in elementary schools that increase youth’s civic literacy and civic engagement with the goal of cultivating the next generation of active citizens. Our approach is to work with K-8 schools to build civic curriculum so students learn and practice the knowledge and skills of effective active citizenship. Our work is in the three areas of Literacy Based Programs for elementary school students, Experiential Learning Exercises for students, and Professional Development Opportunities for teachers. Learn more about our work. We the Civics Kids is a rich interactive program for K-8 students that marries literacy and civic literacy. The goal for the program is to create a culture of active citizenship in a school through materials which build basic civic knowledge, promote engagement, and provide on-going opportunities for developing the art of democratic deliberation. At the same time, We the Civics Kids materials strengthen each student’s reading, writing, speaking, thinking and problem solving skills. To continue building a community of knowledgeable and engaged young citizens, We The Civic Kids includes a project through which staff and students learn about America’s judicial system by writing and arguing a Literature-Based Mock Trial. A comprehensive handbook guides the educator from the first step of identifying a piece of classic or classroom literature on which to base the trial to the final step of jury deliberation. An appendix provides activities and sample Literature-Based Mock Trials to support the work. Since its inception in 2013, The Citizenship Challenge has become a signature offering of The Rendell Center and the premiere experiential learning experience for 4th and 5th graders in the Delaware Valley. The Challenge is an essay contest providing students with the opportunity to express themselves regarding a current issue facing our democracy. The top ten finalists participate in a finals program at the National Constitution Center and receive classroom copies of the We The Civics Kids curriculum as well as a civics library for their school (approximate value of $250.00). In addition, The Rendell Center covers transportation costs to the final event as well as a tour of the National Constitution Center. This program has become an annual outreach. The Rendell Center offers several opportunities for professional development for educators, as well as the financial assistance to make participation possible. These opportunities focus on providing a mix of substantive content of American history, politics, civics and comparative democracies along with the pedagogical tools to effectively use this knowledge in any educational environment. These courses are offered in a variety of formats, including intensive week-long courses, day-long workshops, half-day workshops, and webinars. Our hallmark program is our Constitutional Scholars Summer Institute. In the summer of 2015, The Rendell Center conducted its first 5-day Summer Teacher Institute dedicated to focsing on an aspect of the United States Constitution. In 2015, the focus was on the First Amendment. The seminar included an in-depth study of Supreme Court case law and provided participants with a deeper understanding of First Amendment rights. The costs for the Institute, including housing and meals, are covered by The Rendell Center. Our ability to translate constitutional concepts into simple terms to be used by classroom teachers in engaging exercises is one of our strengths. 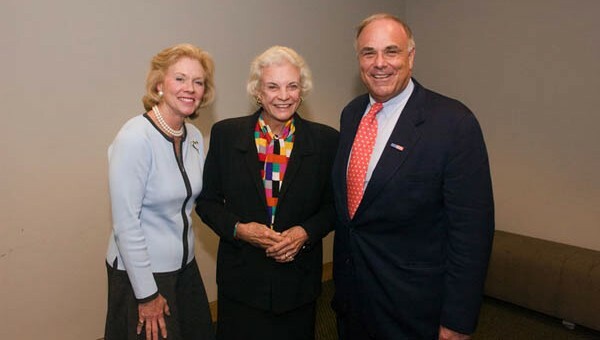 Colleagues in the mission to strengthen civics education in our schools: Judge Marjorie Rendell, Justice Sandra Day O’Connor, and Governor Ed Rendell at a PennCORD conference in 2004. The Rendell Center’s history began with PennCORD. PennCORD, the Pennsylvania Coalition for Representative Democracy, was formed in 2004 as a unique union of educational, advocacy and governmental organizations committed to improving civic learning for students in grades K-12. Created in response to the Civic Mission of Schools Report, PennCORD set out to reinvigorate civic engagement among Pennsylvania youth. PennCORD’s goal was for every Pennsylvania school to prepare its students to understand and participate in their communities, society and government. Building a solid foundation of civic learning for every student is the first critical step toward achieving this goal. PennCORD defined active civic learning as the integration of three learning spheres: civic knowledge, public action, and democratic deliberation. Civic knowledge: an understanding of United States government and history with a focus on the rights and responsibilities guaranteed to each citizen in the Constitution. Public action: the actions taken by each citizen in one’s home, school, neighborhood, city, state, nation and global community. Democratic deliberation: the ability to consider, analyze and discuss issues with others. Founding partners in the coalition included the Office of the Governor of Pennsylvania, under the leadership of First Lady Judge Marjorie O. Rendell, the National Constitution Center, the Pennsylvania Bar Association, and the Pennsylvania Department of Education. To continue the civics education activities of PennCORD, the former Governor of Pennsylvania, Edward G. Rendell, and the former First Lady, Judge Marjorie O. Rendell, initially established “The Rendell Center for Citizenship and Civics” in 2013 as a program at Arcadia University in collaboration with the National Constitution Center (the “Rendell Center at Arcadia”). Subsequently, Governor Edward G. Rendell and Judge Marjorie O. Rendell determined it would be best to establish The Rendell Center for Citizenship and Civics as a separate, stand-alone nonprofit, tax-exempt organization, and thus incorporated The Rendell Center on September 9, 2014 for such purpose.